This white sandy beach area is one of the most famous in the Galapagos, both for its beauty and for its wildlife. Sightings of marine iguanas, sea lions, crabs, birds and, of course, turtles are frequent. There are two main stretches of beach; the first is popular for surfing, though currents can be strong, while the second is more conducive to swimming and snorkeling. Colorful reef fish, rays and white tip reef shark have all been spotted here. To get to Tortuga Bay, you must hike a stone and boardwalk path through trees and cacti, where you might spot some of the Galapagos’ famous birds, such as flamingos, finches, pelicans and the blue-footed booby. Whether you come for the sand or the wildlife, Tortuga Bay is one of the Galapagos’ best offerings for both. Located on the Santa Cruz island, Tortuga Bay Beach is accessible via a 20-minute walk (1.55 miles) from Puerto Ayora. The path is open from 6 a.m. to 6 p.m., and visitors must sign in with the Galapagos Park Service office. There is no admission fee. If you’ve got limited time in Ecuador then see more the Galapagos Islands in less time on a 4-day express tour of the natural wonder. Perfect for lovers of nature, you’ll tick off Galapagos highlights such as the Charles Darwin Research Station, Canal del Amor, and Tortuga Bay Beach, and visit Santa Cruz Island and Seymour Island, home to wildlife such as seals, iguanas, and the blue-footed booby. Accommodation, breakfast, and hotel pickup and drop-off on Baltra Island are included. Maximize your limited time on the Galapagos Islands on a 4-day sightseeing tour of Santa Cruz Island. With airport transfer, hotel accommodation, and breakfast covered, all you need to do is enjoy the wildlife. 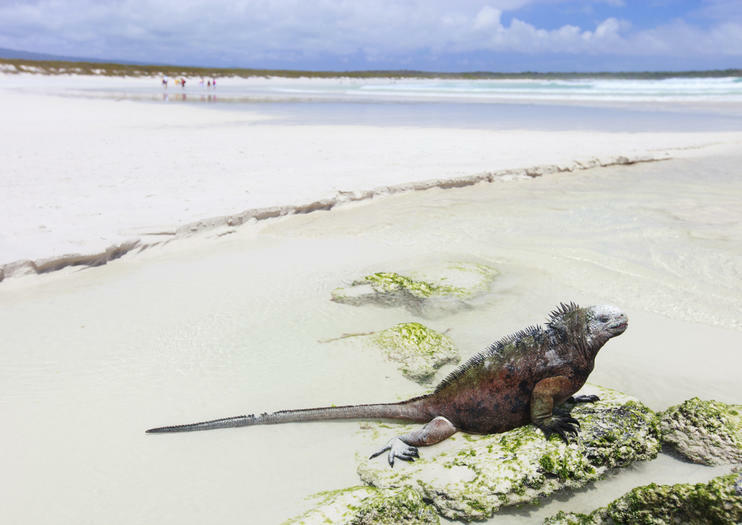 Follow your guide to discover marine iguanas, giant tortoises, sea lions, and much more. Snorkeling equipment and boat transfers are also conveniently included on this comprehensive tour. Spend the day venturing into the Galapagos on an adventure from Santa Cruz Island to Tortuga Bay beach. Enjoy a morning spent relaxing on sandy shores before exploring the bay on a trip to La Loberia Island, another of the Galapagos’ most famous sites. Cut down on planning and maximize sightseeing with this 4-day tour of Santa Cruz Island and a second island of your choosing in the Galapagos. Visit must-see sights on Santa Cruz such as the Charles Darwin Research Station and Tortuga Bay along with a guide, and then spend a day on either Santa Fe, Isabela, or Floreana Island on your own. All transportation, activities, and accommodation are included. The Galapagos Islands with their unique and diverse plant and animal life lie off the coast of Ecuador in the Pacific Ocean. With this multi-day tour, save time traveling between islands by focusing on the most interesting spots on just two. See giant tortoises at the Charles Darwin Research Station on Santa Cruz, and choose between visits to Bartolome or North Seymour Islands. Choose from two unique itineraries for a 4-day Galapagos adventure, which include round trip airport transportation. There’s no better way to experience the islands and maximize your limited time than by live-aboard boat. During the day, your private guide will show you endemic wildlife around the UNESCO World Heritage Site. In addition to three nights accommodation in a private cabin, all meals are included and served by private staff. This 4-day cruise aboard the ‘San Jose’ motor yacht promises you a memorable Galapagos Islands adventure. Set voyage into the eastern side of the UNESCO-listed archipelago and stop at Mosquera, Kicker Rock, Santa Fe, South Plaza and Genovesa. Accommodating a max of 16 passengers, the yacht comes equipped with comfortable twin cabins that boast seaside windows. During snorkeling breaks, see sea lions, turtles and tropical fish. Snap frame-worthy photos of finches, warblers, and red- and blue-footed boobies as you stroll along beaches and cliffside trails. See the highlights of the Galapagos Islands in and around Santa Cruz over the course of four days. Learn about the fragile ecology that makes this archipelago so unique and see native wildlife such as the Galapagos tortoise, the Darwin finch, and the marine iguana. This is a semi-inclusive tour with most meals, accommodation, and transportation included. Experience the best of three of the Galapagos Islands on a 6-day tour. Beginning with airport pickup, both land and water transportation are provided for the duration of the tour, saving you money and stress. Five nights of included accommodation is conveniently split between Santa Cruz and Isabela Island to maximize your limited vacation time. Start each day with a complimentary breakfast, then join your guide for animal sightings and adventure. Navigate the main islands of the Galapagos and get an insider's look at the natural beauty and incredible ecological diversity that makes this one of the world's top attractions. Book a last-minute cruise and discover what all the hype is about! Our Galapagos Ideal allow you to explore Galapagos from a completely different perspective. This fantastic, active 6-day program offers you diving tours in places where are manta rays, barracudas, hammerhead sharks, seahorses, and more will be regularly seen. After this incredible experience underwater, you will go to the highest point on the Islands to enjoy a beautiful hike to the Sierra Negra volcano.To participate in this tour you need to have a valid PADI certificate. If you are interested in a diving course, please take a look at the 6 day diving course in the Galapagos. • This is a fantastic journey in which you will explore two fantastic locations within the South America region. On the one side you will get involved in the royal Inca Trail which unique route will leave you astonished until you reach the beautiful Machu Picchu. The best to come will be in Quito a traditional city in which you will visit Antisana Natural Reserve, Avenue of the Volcanoes, Riobamba, the ‘Devil’s Nose’ railway, Cuenca, Guayaquil and the extraordinary Galapagos Islands. This 15-day tour of Ecuador lets you hit the country's essential sights as well as get off the beaten track without planning a thing. Visit highlights in each of Ecuador's diverse regions: the Amazon, the Andes, and the Galapagos—all activities, meals, transportation, and accommodation are included as described in the itinerary to ensure a great trip. Combine 3 days minicruise around Santa Cruz main islets with snorkeling and hiking in Isabela island. Take a minicruise by Santa Fe, South Plazas, Bartholomew and North Seymour then stay 2 days in Isabela choose to snorkel in: Cape Rose, Turtle island and 4 hermanos. Also hike to Sierra Negra and Chico Volcanoes. 18 Day Ecuador & Galapagos Community Service where you will have more time to see more of Ecuador and the islands while helping orphans, school children and nature. The ideal age for this trip is from 13 to 17. This a group tour, our travel director with chaperons will meet participants at major hub airports in the United States to begin the journey, be with them 24/7 and return the same way. Our programs are safe, educational and fun! Unique 8 days Galapagos program with 6 islands to discover !! With this tour you will see the best of the Galapagos Islands and you will have a unique wildlife experience. Land and marine creatures that can only be found here. Follow the steps of the scientist Charles Darwin and be surprised like this wonderful place.This is a combination of a lot of money and making a dream come true.We assure you with this tour to the best snorkeling in the world on Isabela Island, the best beautiful landscapes on Bartolome Island, swim in the beautiful Tortuga Bay, practice live fishing in Santa Fe island, or just to take a break in this magical place. The volunteer and travel Experience in the Galapagos Islands allows to see the unique flora and fauna, while meeting local people and learning about the Ecuadorian culture. The activities organized help to conserve this unique spot declared Natural Patrimony of the Humanity in 1978. According to the time you have available to join our program we will organize the itinerary so you participate on volunteer activities and also visit the highlights in each island on day tours.